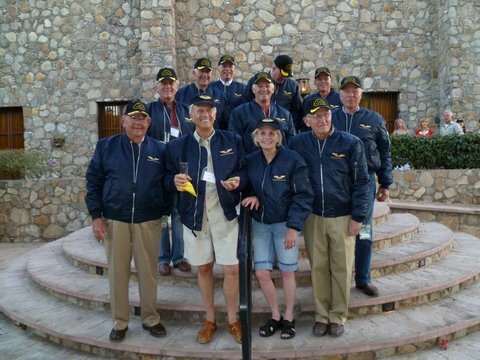 Club Pilotos member Bill Allen, long time member and Alamos home owner, participated in the U.S. Mail Centennial cross country flight (Washington, D.C.-Seattle) on the San Diego-Seattle leg. The group departed from his aviation museum in San Diego and below is a link for ‘the rest of the story’. Fly down to Alamos for a unique Thanksgiving. Yes, it’s the old fashioned style Thanksgiving dinner with all the trimmings, including the best pies in Mexico (Pecan, Pumpkin & Fresh Apple). The Hacienda’s Thanksgiving experience always gets raves. The ‘Fall Club Pilotos Reunion’ was over the top with a large turn-out, two fascinating guest speakers and many activities for the group. Two of our members, Hubert & Patte, offered our good friend and incredible photographer and video person, Mike Foster, to experience the Copper Canyon in their newest Cirrus. This was Mike’s first time to fly in a small plane and to quote, “It was the greatest single experience of my lifetime”. At the end of the video you can let it continue and a new ‘Day of the Dead’ video will commence which was just created this past week also by Mike. At the conclusion of each video, be sure to hit the ‘Like’ button. Just as a reminder, now’s the time to get your reservations in for Christmas and the memorable Posada which is on the 24th of December. Jamie has a big band lined-up for our New Year’s Party, so take a week in Mexico and enjoy both events. 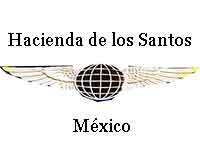 Today I received a copy of a SAT (enforcement arm of the Mexican IRS) notice which was sent to pilots with Mexican registered aircraft, and also at least one American pilot with US registered aircraft. The essence of the notice is that if you have your aircraft parked on a public airport or ramp, you risk having the SAT temporarily detain the aircraft until it is determined that it actually has a current permit (such as Multi entry or other for Mexican registry). They gave an example of one being taped with notices not to access or move the aircraft. If on a private strip, or in a private hangar then there is no concern. Also, if you are at the airport there’s no need for posting in your window since you are available to show that you have proper papers for having the aircraft in Mexico, such as a multi or one time entry permit. It was suggested by the SAT, to attach to the inside of a window a copy of the permit. It is okay to reduce the size of the permit, but make sure that the dates and ID information are clearly visible. I personally have not known of this ever happening, however the official notice I do have a copy. If the official ‘Informe Urgente’ does not appear below’ you can send me an email at jnswick@aol.com and I will forward it to you. We are looking forward to seeing many of you at XALA in just a week for the annual ‘Club Pilotos Spring Reunion’. This year’s music festival (Festival Alfonso Ortiz Tirado…FAOT) broke all records for being over the top. With 100,000 attendees, over the nine day event, it topped the previous year by 30,000 lovers of music and dance. A special treat for about 40,000 Mexicans and a few hundred foreigners was on the last day when the Tiger Squadron, from California, performed over the village. 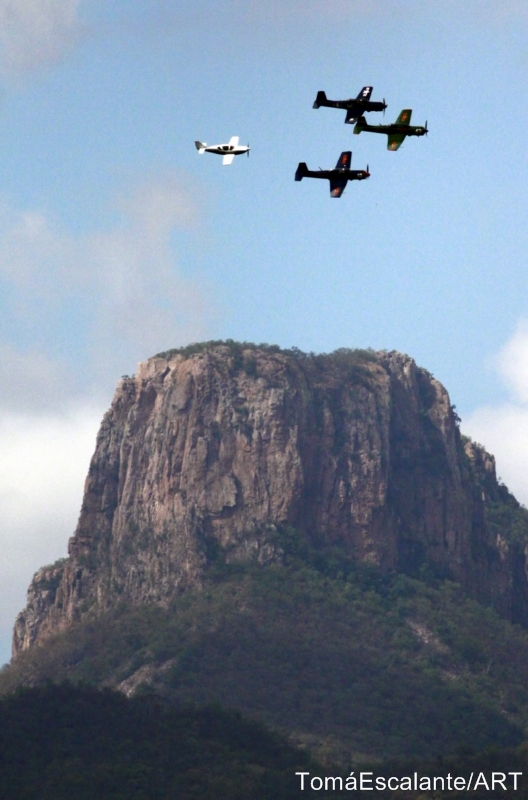 We want to thank our ‘Club Piloto’ Capitans, Craig Ekberg (team leader), Dave Klein and Guido Rietdyk….all flying beautiful Nanchangs in three different military color schemes. Just a week later we were delighted to have a special guest visit for the first time. This man had a reservation in September of 2008 and cancelled just the day prior to his visit after weeks of preparation by his staff. Instead, not wanting to waste the reservation he sent the Vice President of Mexico. The V.P. orchestrated the annual CONAGO (annual conference of Governor’s of Mexico). President Felipe Calderon (2006-2012) was with us for three days, along with his wife who some predict to be the next President of Mexico. Also attending a private event at HdlS was Mexico’s oldest living Catholic Cardinal, Juan Sandoval Iñiguez, along with one of Mexico’s top film actors and also one of the best known ‘novela’ actors, or ‘soaps’. It has been a wonderful winter at Hacienda de los Santos, but we still need ‘YOU’! Write today for a room or suite at the ‘Piloto Spring Reunion’. March 13th is only five weeks away, so don’t miss this great value and fun event. The annual Festival Alfonso Ortiz Tirado (FAOT) begins on January 20th and runs for nine days thru January 28th. Bigger and better than ever, this years dozens of performances not only include music but also an Art Walk, Video presentations, Workshops & Conferences, Shows for Children, Indigenous Dancing and Food, plus several venues throughout the village. This is the largest music festival in the country and one of the largest in the world based upon the number of days, and live performances, during the event. For details on this spectacular event visit: www.festivalortiztirado.gob.mx. For reservations at Hacienda de los Santos contact Jim with your specific dates of arrival and departure. He may be reached at jnswick@aol.com. As we wrap-up 2016 we want to thank each of our Club Piloto members for your support this past year. Each year we are seeing more activity at Hacienda de los Santos and the wonderful village of Alamos continues to be discovered by more people from around the globe. 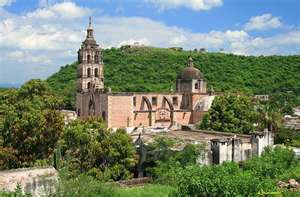 Thanks in part to the TV series a few years ago, Mexicans now know about Alamos and there’s a resurgence of interest by those from Mexico to not only visit but to purchase homes in the village. In such a small town it doesn’t take much to stimulate the economy and the new construction, plus remodeling and hiring of household staff, really has a positive impact on the community. Street improvements, beautification and even a new 3,500 person capacity convention center is under construction which is at the edge of town with plenty of parking. No doubt the new center will make a difference especially for the ever growing an expanding FAOT (Festival Alfonso Ortiz Tirado) music festival which is in its 30th year in 2017. XALA….We have been promised by the State of Sonora, a seal coat for both ramp areas, as well as the 5,000′ runway. As usual the security is tops with a friendly airport staff as well as military 24/7. Hacienda de los Santos….What’s New? This past summer we added a new stone building to the ‘Casa Amor’ area which houses additional storage area for the commercial laundry, equipment area along with two new public bathrooms in a very colonial setting along with a large new fountain. This area doubles as our wedding Civil Ceremony area and is quite beautiful with the bouganvilla backdrop by the deep blue tiled pool. Also, we have added two ‘Fat Tire’ electric bikes to our fleet of Beach Cruisers and Mountain Bikes. For just three dollars (or Pesos) a regular bike may be rented, or for only $6.00 a day one can experience the off-road style electric bike. We have a nice selection of new helmets which are included in the rental. March will be here before we know it. If you haven’t make reservations yet for the ‘Spring Club Pilotos Reunion’ do so now and don’t be disappointed. The dates are March 13th to the 17th, with Early Birds on Sunday the 12th. At our ‘Fall Reunion’ we had a record number of ‘Double Early Birds’ who arrived on Saturday. Unfortunately we are sold-out on March 11th (Saturday night) and cannot take any ‘Double Early Birds’ on that date. Some of you will be here this coming weekend for our annual ‘New Years’ Gala’ and we look forward to seeing you. We will have a large band this year, and weather permitting (which is usually does) we will have the party on the large portal with the outdoor stage in use. There is ample parking available in the hangar and if you would like a last minute reservation drop me a note today at jnswick@aol.com. Also, Bill Frisbie, passed away this Fall and he lived a very full and long life. His aviation background is probably as rich as most any pilot one could ever hope to know. Both he and his wife Joan attended countless ‘Reunions’ and he was our featured speaker just a few years ago, in part, telling about his assignment to train the very first Air Force One (747) pilots during the Reagan era. He was also a back-up pilot for Air Force One. If you haven’t experience an Alamos Christmas make this the year. At Hacienda de los Santos we have a live Posada on Christmas Eve which is a very memorable event. 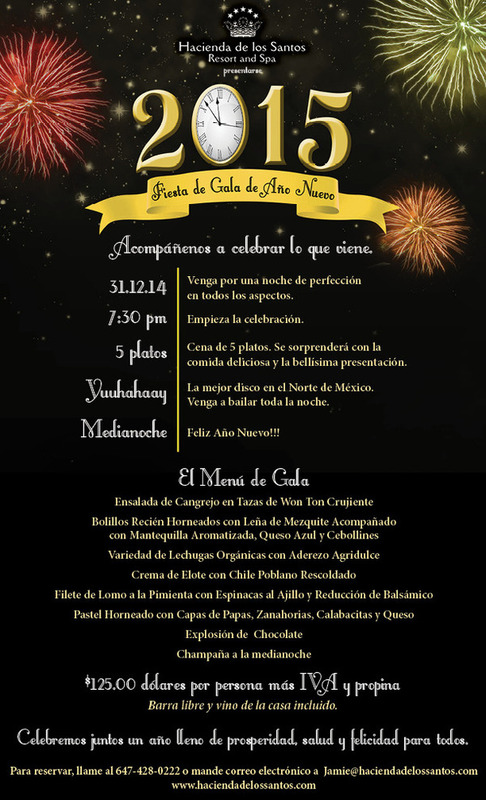 Christmas Day with the Hacienda meal is special and don’t forget about our gala New Year’s Party. This year we will have a special band for the seven hour event, four course dinner, all drinks and wine and everything included at $125 per person (USD+tax). Two Suites Available ..call now…..
Due to medical issues we have had three last minute cancellations for the October 31st ‘Club Piloto’ Reunion. At present. we have 28 couples planning to attend and there’s still room for a few more. If you think you might be able to make the Fall Reunion, send Jim an email at jnswick@aol.com so he can answer any of your questions or give you a confirmation. The weather no doubt will be ideal for flights to and from the US and Canada, so come on down and enjoy the festivities at our low prices which include lodging, meals, transportation to and from the Hacienda hangar, local tours, classes, informative talks and a great deal of fun with fellow pilots. Last week a mailer went out to ‘Club Piloto’ members with an ‘Pre’ Itinerary of the October 31st five day event. We had a medical cancellation yesterday so there are two Spa rooms now available if you haven’t signed-up yet or have friends that you would like to invite. If it is their first visit to Hacienda de los Santos we will give you a $100 USD credit on your ‘Piloto’ account. This years event falls on both of the ‘Day of the Dead’ dates in Mexico which are November 1st and 2nd. We will be having Mike Foster who is probably the number one producer of quality videos (more than 200) on topics that relate to Alamos indigenous groups (Yaqui, Guarajillo, Raramuris or Tarahumara and the Mayo). All of these groups live within 40 miles of Alamos and some are much closer. Mike also covers in his work many of the medicinal practices that have been passed down through the ages within the tribes, as well as studies on flora and fauna. For this month’s event, his program will be on ‘Day of the Dead’ and he will be using some of his videos in conjunction with the talk. Jim’s, pre-breakfast walks, will include an early morning visit to the local cemetery during the week to see the great displays of flowers, as well as visiting the local market area to see the flower vendors. Also, there will be cooking and art classes, Texas Holdum’ with our Vegas dealer Doug, live music every night with romantic guitar, La Estudiantina (young men in colonial attire singing and dancing with music from 18th century Spain) and a Mariachi. A complimentary narrated area tour will be available for the newcomers as well as a tour to the mining village of Aduana one morning. Rates and additional details are on this site, plus the dates for our March 2017 ‘Club Pilotos Reunion’. With the announcement on January 20th of the worldwide awards for Trip Advisor Hacienda de los Santos Resort & Spa received some very good news. Of the thousands of small hotels in Mexico, Hacienda de los Santos not only made the ‘Top 25 Small Hotels’ list again, however this year took the top spot as the ‘#1 Small Hotel in Mexico’. In the ‘Service’ category Hacienda de los Santos also made the ‘Top 25 in Mexico’ which included hotels such as ‘La Casa Que Canta’, ‘Esperanza’ at Cabo San Lucas’, the ‘Four Seasons’ at Punta Mita, with a ranking of the ’14th Top Hotel for Service’ in Mexico. The Swickards, and staff of 40, wish to thank each of you for your continued support of Hacienda de los Santos, plus helping us achieve many of our goals with your most important suggestions through the years in how to continually improve our resort. Our level of repeat business is possibly one of the highest in all of Mexico and we do appreciate your continued support. Hacienda de los Santos in November received an award in London, from ‘Boutique Hotel Awards’, for ‘The Americas Best Romantic Retreat’. The award covers the geographic area of North and South America. Pilotos……we thank each of you who have taken the time to write one of the wonderful reviews on ‘Trip Advisor’. You have made a difference with Hacienda de los Santos. 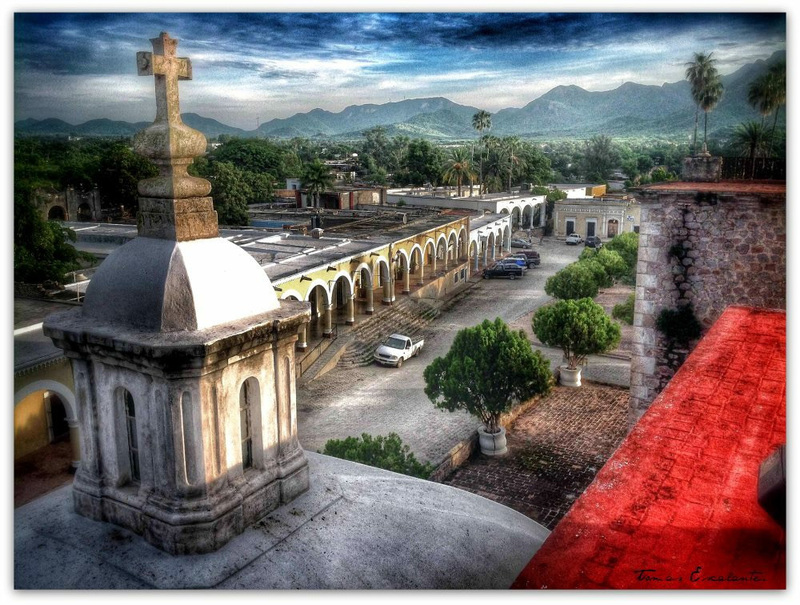 Annual Music Festival in Alamos…. The annual music festival in Alamos (http://festivalortiztirado.gob.mx/) dates are January 22nd to the 30th. This festival originated in the 1980’s as an opera festival in honor of the ‘Caruso of Mexico’, Dr. Ortiz Tirado who was born in the village. As the years progressed the festival became larger, and more well know throughout the country, until it expanded into all types of music and later included dance too. Although this year it will run for the full nine days as usual it will not be ‘international’ as in years past with 12-14 foreign countries represented at great cost to the federal and state governments. Due to an error a year ago with the offices of the state government the essential applications were not processed by the federal government, thus funding was greatly reduced. It will still be a wonderful festival according to all reports, but the Sonoran directors of the event will be relying more on talent closer to home. For pilots, and their guests, wanting a package for this event, just contact Jim giving your planned dates for attending and, depending upon availability, he will give you a special unpublished rate for this event. Plus a village tour for first timers, complimentary hangar parking, transportation to and from the airport as needed and a staff of 40 to make your experience over the top. Thanks to fellow ‘Club Piloto’ member Ron Hays of Santa Barbara, California for the aviation links he forwarded below. Ron and Nancy Hays are among that rare group of people who have a high number of hours flying Mexico in a beautiful Beech Baron. 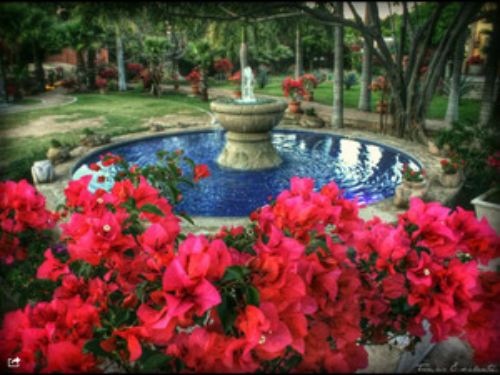 They have virtually seen ‘all’ of Mexico and continue to enjoy visiting Hacienda de los Santos®. From time to time we receive links of various types regarding different periods of aviation history, detailed information about a specific aircraft, or even specs on antique and new aircraft, etc., but this is the most complete library that one could hope to have on aircraft, pilots and history of WWI/WWII/Korea/VietNam, all under this Blog. Be careful about clicking below, it can become addictive. This is a nearly all inclusive price with all meals, a Posada Tacubaya Guest Room, Complimentary Margaritas and Totopos at the Hangar Party, Cooking Classes with Chefs Rene & Rosa, Art Classes, Morning History Walks, Evening Dancing Under the Stars plus live Music Nightly and a complimentary guided tour of the village for all first timers. The ‘Early Bird’ arrivals on Sunday the 25th, for only $195.00 per couple will receive their lodging (regardless of Hacienda Guest Room or any Suite), plus lunch and a Five Course dinner with the owners in the private roof-top ‘El Nido’ grill at Hacienda de los Santos®, with cocktails and wine included. Plus you very likely will have hangar parking as an ‘early bird’ arrival. Usually we park 10-12 aircraft in the hangar for the piloto event. What’s Different about Hacienda de los Santos®? There are no ‘Resort Fees’, No Bottled Water Charges, No Hangar Parking Fees (First Come Basis), No Wi-Fi charges, No fees for Ground Transportation to and from the airport or anywhere in the village as needed, No Coffee or Tea charges…in other words, you won’t find unpleasant surprises on your bill at check-out. Liquor and Spa charges will be added to your bill. A ‘Green’ Resort in Every Sense…. As each year passes at Hacienda de los Santos® we keep increasing the many ways to save our valuable natural resources. Quite often by reducing water, gas and electric costs we in turn enjoy an improved bottom line. Ultimately it means that you, the guest, will see lower rate increases too as we deal with the effects of inflation which are inevitable. Although, in Mexico, it isn’t cost effective for us to install solar electric panels (there are no government incentives here), we are making progress in other areas. We now have more than 90% exterior lighting as LED. The Light Emitting Diodes have helped us lower an ever increasing electric bill by as much as twenty percent some months. Hardly a month goes by where we don’t find new LED fixtures which can replace either the incandescent or fluorescent lights. If you have a swimming pool at your home and haven’t switched from a conventional 400 or 500 watt bulb to a 40 watt bulb there is a huge savings. What we have found with four pools with lights is that the additional savings is that the LED’s have huge life spans, plus the cost of the regular pool lites was significant, plus the labor to install nearly every year. A year ago we installed one hundred 1 watt bulbs in 100 different exterior fixtures in the Hacienda. They run every night of the year, some all night, and in twelve months not a single one has burned-out. Possibly it has something to do with the information on the box for the bulb, “Estimated life 47 Years”! That number is based upon only three hours a night, however with an average of six hours per night that’s still a 23 year life span for a ten dollar bulb. They are expensive, but as you can see at Home Depot, Lowes and Costco the prices are coming down, ‘poco a poco’ (little by little). It’s hard to imagine but our ‘Hacienda’ is seeing the replacement of the air conditioning (A/C) systems. I was viewing them as nearly new and recently reminded that some are about twenty years old. Fortunately as we work through our replacement program we are able to increase the efficiency significantly. In April I met with an expert on this topic in the U.S. and what I used to consider a power saving A/C system is not even close. State of the art A/C today can have a SEER (a rating system on energy and the lower the number the higher the power consumption) as high as 25. Here’s what that number represents if you put one in your 1,400 square foot home today, plus added a reasonable number of solar panels on the roof, you could in Arizona run your A/C system in the summer for the same amount of power as a 60 watt light bulb. In Mexico we are trying to be in the SEER 15 range which is much more than our original SEER 10 units. Just another factor in lowering the federal electric bill here. Adding 14 TV’s would have driven the light bill up a few years ago with the old tube sets, but the new flat screens are much more economical, thus every suite at Hacienda de los Santos® now has about 90 cable channels available with three or four in English. With the expanded industrialization in Mexico, for the first time ever many regions are about to receive natural gas. All of Sonora’s major cities in the next two years will see conversions from propane to natural gas, thanks to a major line being installed from one end of the state to the other. Unfortunately it’s not in the cards for Alamos, a small village, to receive a forty mile line from the main feeder line. Just one more reason for us to look at ways to use less gas. Now we have eight solar collectors for water and half of those supply our kitchen and laundry areas. To increase our efficiency, lower our costs, reduce water consumption we now have low water usage laundry machines, plus a 1,000 per hour plate capacity dish washer in the kitchen. Our laundry, as opposed to the kitchen, only operates during the day, thus nearly all of the hot water is provided by the sun and nearly half the water which was previously required. 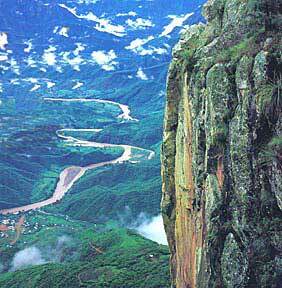 Yes, come down in July and August and you will seen Alamos at its best with a green lushness like Ireland. Truly and experience not to be missed during our monsoon season. It’s also our Mango time when we harvest the fruit, make the preserves and have some of the best available. Come down in the summer and we will give you a jar of the best Mango Jam this side of the Rio Grande. Nearly all mornings are very flyable so one has at least six good hours of flying time before it gets a little bumpy. For complete flying information check the ‘Flight Planning’ section of this website. March ‘Reunion’ Not to Be Missed…..
Our ‘Spring Club Pilotos’ Reunion for 2015 is one which you won’t want to miss. This years featured speaker, Bram Tilroe and his wife Edmee, are flying down for the event from Canada. Bram is no stranger to Club Pilotos and they have been to the Hacienda many times in the past. What is especially interesting is that Bram offered us a choice of five different programs on flying in Canada and Alaska. The decision was very difficult to make since they are all of great interest, so I selected three of the five and he agreed. We will have a 90 minute (+-) program beginning on Wednesday, March 4th, the second program on Thursday afternoon and the final on Friday afternoon. That will leave Saturday afternoon open for the traditional Texas Holdum’ tournament. Bram has been very active in the Aviation industry for the past 52 years. He obtained his pilot’s licence with the Royal Canadian Air Cadets in 1963 at the age of 18. Subsequently, he joined Transport Canada in Meteorology in 1965 and was posted to Yellowknife as a weather briefer and observer. Bram then joined Wardair Canada Northern Operations, and flew throughout most of the Arctic including the Geographic North Pole. In 1970, he returned to Transport Canada to train as an Air Traffic Controller, after a brief stint in various Towers he checked out in 1972 as an IFR controller in the Edmonton Area Control Centre. He spent 33 years as a Terminal Radar Controller (Approach, Edmonton and Calgary) and then joined management with NAVCANADA as Chief for Edmonton International and Edmonton City Centre Control Towers until his retirement in December of 2005. He is still very active in General Aviation through participation at the executive level of various aviation organizations. He has organized some 16 Airtours throughout NW USA, Western and Northern Canada and Alaska. Bram holds a Glider licence, has logged over 630 flights, and is an IFR rated pilot with over 4400 hours. He has owned various aircraft and in 1983 purchased a new Piper Dakota aircraft which he still flies actively all over North America. Since March, 2008 he serves on the Nav Canada Advisory Committee which advises the NAV Canada Board of Directors on Aviation relating to ATC and the Air Navigation Service. All of the presentations will be in the Hacienda Theater on Wednesday, Thursday and Friday afternoons at 2:30 p.m.. For information regarding the topics on flying ‘Canada’, including procedures, go to ‘Events’. ‘Piloto’ in Hollywood Produces a new Musical…. Veteran filmmaker Mark Wolper has been producing for film and television for more than 20 years. As president of the Wolper Organization, he has been involved in many high-profile projects, including the Academy Award-winning crime drama “L.A. Confidential,” starring Russell Crowe, Kevin Spacey and Kim Basinger; the multiple Emmy-nominated miniseries “The Mists of Avalon,” starring Anjelica Huston, Julianna Marguilies and Joan Allen; “The Thornbirds,” starring Richard Chamberlain and the Emmy-nominated and NAACP-winning miniseries “Queen,” starring Halle Berry. He began his career in 1981 as an independent producer, working with such studios as Warner Bros., Showtime, MGM and Disney on projects ranging from short films and documentaries to miniseries and foreign feature films. In 1987, he joined his father, David Wolper in leading The Wolper Organization. Over the years, the company has been responsible for more than 500 films, which have won more than 150 awards, including two Oscars, 50 Emmys, seven Golden Globes and five Peabody Awards. Now, as he describes it, has a new hobby, which is creating his first musical. It opened last week in West Hollywood and below are more details about both the production, as well as some very positive reviews. From the web also, ‘SERRANO the Musical’, is described as a musical comedy set in ‘the mob’ in New York City’s Little Italy. Serrano, the POET, LOVER … HIT MAN’ is a Serrano is a modern take on the French classic, Cyrano de Bergerac. For those of you in Southern California, if you get a chance, take in ‘Serrano’ which is a spoof about a modern day Cyrano Debergerac, set in New York City. Here is the link::: www.serranothemusical.com Go to the tickets tab. If you are able to attend, drop me a note and anything you would like to tell Mark about your experience and I’ll pass it on. Here’s the site for ‘Serrano’, also the various reviews. Enjoy the show! Also, if you enjoy music the Ortiz-Tirado Music Festival begins its nine day run this week (on Jan. 23rd) in Alamos. This year, all of the hotels in Alamos were sold-out nearly two months before the event. You won’t be disappointed if you make reservations for next years festival which is the last eight or nine days of January. New Year’s Party, plus New (this) Year! Here’s the details on our New Year’s Gala. Many of our ‘Pilotos’ arrived a week early so they could participate in the ‘Posada’ and Christmas activities in the village and at Hacienda de los Santos. There’s still room for a few more for New Year’s so give us a call today at 888-777-0164 for reservations and space in the hangar. Note, the per person rate includes all drinks for up to seven hours:), plus the six course dinner, entertainment and favors. “New (this) Year”, includes our new colonial building at the Sugar Mill which makes a wonderful backdrop for parties of up to 500 people, plus there are additional restroom facilities, a new air conditioned gym ‘with a view’, a large ‘bodega’ for our event equipment and a new private suite with four spanish balconies overlooking the ‘hidden’ arroyo. Behind the scenes, a new walk-in freezer and complete high speed, high temp, dish washing unit was added to our kitchen operation. How ‘high’ is high speed, well they indicate 1,200 plates an hour. That should be enough capacity for a remote resort in the beautiful Sierra Madre of Mexico. Reducing our ever increasing utility bill is one of the challenges we have tackled during the past couple of years. Now with state of the art exterior LED lighting we have had a professionally designed uplighting system installed on our dining and cantina areas, as well as on the entrance side of the resort. We hope you enjoy seeing some of these improvements. Also, all suites now have flat screen T.V.’s, Blu-ray players (DVD rental is complimentary) and the flat screens range up to 60″ in size for your viewing pleasure. By February 1st we will have cable service at the resort for the suites with approximately 200 channels available. Have a ‘Happy New Year’ and we hope to see you in 2015. Our ‘Club Piloto’ event which ended on November 2nd was very special this year. On Saturday evening, November 1st, Rito Valdez (our art director), opened the special altar for ‘Day of the Dead’ which honored two of our pilots which made the final flight in 2014. Ret. Admiral Bruce Boland and Zak Margolis both had their photos present and a few solemn moments were taken by the group to remember them as each lit a candle at the altar. We are seeing more and more talented videographers, and photographers, come to the village to do their work. We hope you enjoy this most unique and beautiful ‘Day of the Dead’ video which was filmed and edited by Mike Foster. Here’s the link for the 13 minute video which is of exceptional quality. The October 29th arrival date for our annual ‘Fall Club Pilotos Reunion’ will be here in just four weeks. We are 90% sold-out for the event and looking for just a few more pilotos to help us make this a great event. Just drop me a note if you have questions, or want us to hold a room for you. Remember, if you are already a member you can get a $100 (USD) credit on your Fall Reunion account by having another couple come with your, or in their own airplane. Mexico’s eApis is becoming more defined, little by little (or poco a poco, in Spanish). Here’s a reprint from the September 30th AOPA bulletin for your information. I’m sure that in the next couple of weeks there will be additional details from both Rick Gardner and Jack McCormick regarding the filing process. The Mexican government has lifted a requirement that pilots of arriving and departing private general aviation flights use a third-party provider to file the required Mexican advanced passenger information system (APIS) manifests, and has clarified related procedures. Responding to an April 2014 inquiry from Rick Gardner of Caribbean Sky Tours at the request of AOPA, Mexico’s Instituto Nacional de Migración (INM) issued a clarification addressing some aspects of procedures pilots must follow. In the communication—the first written communication received on the matter from Mexican officials—INM confirmed that as of September 2014, general aviation pilots of private flights can file the APIS form themselves under an interim process. A manifest must be filed by completing an approved Excel spreadsheet that is similar, but not identical, to a spreadsheet used by ARINC for Mexican APIS filings. Based on the approximately 32,000 U.S.-Mexico border crossings each year, AOPA estimates that allowing pilots to file directly will result in a savings of $1.6 million per year. The required timing of APIS filings also has been modified. The manifest must be emailed within 24 hours of departure, and resent 30 minutes prior to takeoff to confirm the flight. Pilots will receive a reply from Mexican Immigration that the manifest has been received. The Mexican government is continuing work on a free public portal for pilots to use in filing APIS information. This AOPA Online page contains a summary of issues addressed in the INM’s letter. In 1997 when I returned from the Piper factory in Florida with my new deep blue Archer III, I experienced one of the strongest winds in the Tucson area up to that point in time, and possibly since, when preparing to land. If one is vectored a little northeast of Tucson International (just a few miles) and you are near or at pattern altitude, you can get some good views of ‘The Boneyard’. My approach was in slow motion that day so I was able to get another good look at ‘The Boneyard’ and the thousands of aircraft in storage. Later, with many lessons at Tucson International for my instrument rating, I only then began to realize something about the power of the Boneyard as it related to afficionados of aviation from all over the world. Often, visitors from Asia and Europe were hiring rides out of TIA laden with high powered cameras for photo flights over the Boneyard. It’s really quite easy if Davis-Montham isn’t too busy, just ask the Tucson Tower if you can take a look at the Boneyard. They are always happy to allow that sightseeing flight if conditions permit. The following article appeared in Code One Magazine. Those of you who are former pilots F-16, F-111 and a few other fighter aircraft might be familiar with this magazine, by Lockheed Martin, which supports various fighter aircraft. The author of the article below, Jeff Rhodes, graciously is permitting us to reprint the story for ‘Club Pilotos of Mexico’. After this well written story, I am sure you will be spurred on like me, to take the Boneyard and Pima Air Museum tours and really check out these aviation gems in Tucson. Just across the street is the huge Pima Air Museum. One item at the Pima Air which I found as very impressive, was the gattling gun from an A-10. The gun which fully mounts in the nose is the size of a VW bug. Those Warthogs are larger than they appear. Also, one item at the Pima Air which I found as very impressive, was the gattling gun from a Warthog which is the size of a VW bug. Pima Air Museum has a good restaurant and it’s a great place to spend the whole day. One of the directors is Bert Zaccaria, who comes to the Hacienda in a variety of high performance aircraft with his wife Laura, and is a member of ‘Club Pilotos of Mexico’. The US Army Air Forces began storing aircraft at Davis-Monthan AFB, Arizona, on 1 April 1946. Since then, this 2,600-acre facility widely known as The Boneyard, has had the image of only being the end of the line. But the primary purpose of The Boneyard is storing aircraft. Since 1964, Davis-Monthan has been the primary storage area for all US Department of Defense aircraft. 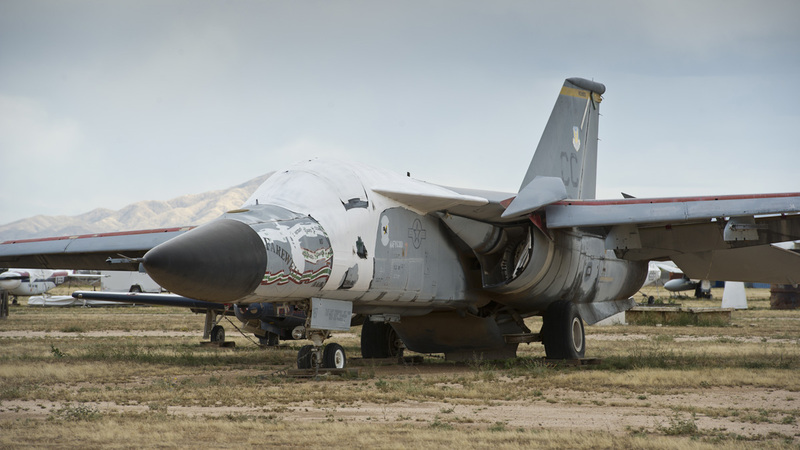 This F-111, formerly assigned to Cannon AFB, New Mexico, is one of the last Aardvarks in storage at the Boneyard. The US Army Air Forces began storing B-29 bombers and C-47 transports at Davis-Monthan on 1 April 1946. Since then, this 2,600-acre facility widely known as The Boneyard, has had the image of only being the end of the line where military airplanes went to be scrapped. Even a previous name—Military Aircraft Storage and Disposition Center—reinforced that impression. But the primary purpose of The Boneyard isstoring aircraft. Since 1964, Davis-Monthan has been the primary storage area for all US Department of Defense aircraft and, recently, for aircraft from two Allied nations. Currently, there are about 4,000 air vehicles of all types stored in neat rows along with 7,000 engines and close to 400,000 pieces of tooling used to manufacture a variety of aircraft, including B-1 and B-2 bombers, A-10 close air support aircraft, and C-5 transports. The chief reasons for selecting Davis-Monthan as the site for this storage center are Tucson’s meager rainfall—less than eleven inches a year—low humidity, and alkaline soil. These conditions make it possible to store aircraft indefinitely with a minimum of deterioration and corrosion. In addition, the soil, called caliche, is very hard, making it possible to park aircraft in the desert without having to use concrete or steel parking ramps. But not every aircraft or helicopter that is flown to the Boneyard stays there. In addition to a relatively small number that are only stored temporarily, some aircraft are towed from their desert parking spots and returned to service every year. However, most of what comes out of The Boneyard is aircraft parts. The numbers vary, but more than 200 aircraft come into the Boneyard every year. In nearly every case, the aircraft are flown in. The delivery pilot or crew taxies to the end of the Davis-Monthan runway, goes through the open gate, and parks on the AMARG ramp. The next stop for a newly inducted aircraft is the flush farm where the fuel system is purged. Replacing the fuel with 10/10-weight oil, each engine is run up briefly and shut down. The oil is then drained. This process leaves a residual protective film in the tanks, fuel lines, and engines. Oxygen, hydraulic, and pneumatic systems are also preserved. The aircraft then goes to the wash rack where it is thoroughly cleaned. Aircraft preservation follows. Large seams, joints, and control surfaces, as well as canopies, windows, and openings on the upper half of the aircraft are taped over and barrier paper installed to keep moisture out. A thick black layer of sprayed-on latex, called Spraylat, is then applied. This serves as the preservative layer. White Spraylat is then put on top of the black Spraylat to provide temperature control. The white Spraylat keeps the aircraft interior ten to fifteen percent cooler than the outside temperature. A relatively recent innovation is that on many larger aircraft, breathing tubes—PVC pipes pointed toward the ground—are installed to ensure interior air circulation. “Every 180 days each aircraft is checked for whatever animal or bird would like to make its home inside,” noted Pittman. “We check the seals on the Spraylat and the plane’s overall general condition. Every four years, we’ll completely re-preserve an aircraft.” Re-preservation sometimes includes running the engines. When an order comes in for a particular part—for instance, a hydraulic pump for a C-130E for an international operator—the AMARG technicians use a negative inventory system to find it. Checking the inventory, the remaining pump in the best condition or with the fewest flight hours is chosen. The aircraft where the part is located is identified. The pump is removed, checked, and then prepared for shipment. Shipping parts is an art in itself. Nothing is standard. Usually a specialized container for a particular part has to be built at the on-site carpenter shop. For large structures like wings, the shipping container is simply built around the outgoing part. Over time, some of the Type 2000 aircraft are reduced to skeletons with multiple parts and structures removed. A good example is the early 1960s-era WB-57 high altitude reconnaissance aircraft. To keep the three WB-57s flown by NASA operational, several of the remaining EB-57 airframes at AMARG have been picked almost clean of their parts. The AMARG carpenters simply build wooden stands to support what remains of the aircraft. Shortly after the Royal Australian Air Force, the last operator of the F-111, retired its fleet in 2010, the aircraft stored at AMARG were moved into Type 4000 storage. What had once been several hundred F/FB-111s have nearly all been scrapped. The last of the nearly 260 C-141s stored in the desert was cut into sections and destroyed in place in early 2013. Other well-known aircraft types are also disappearing. AMARG regenerated its last F-4 in support of Air Combat Command’s full-scale aerial target program in 2013 after it spent nearly twenty-four years in storage. Of the thousands of Phantom IIs built, most have been scrapped and only a small number remain. Likewise, only ten F-14 Tomcats currently being held for museums are in storage at AMARG. Not every aircraft at AMARG ends up with a big red D. Some are pulled into AMARG’s large, fifty-two year-old open air maintenance shed—soon to be augmented with a state-of-the-art maintenance hangar—and returned to flight. In 2013, the first of four retired US Marine Corps KC-130R tankers was pulled out of long-term storage, made airworthy, and flown to Hill AFB, Utah, where the 309th Maintenance Wing, AMARG’s parent unit, is upgrading and modernizing them for service with the Japanese Maritime Self Defense Force. Under a US Navy program for an international operator that began in 2007, a dozen P-3C Orions have been pulled out of storage at AMARG, disassembled, and trucked to the Lockheed Martin facility in Greenville, South Carolina. There, these maritime patrol aircraft are receiving new wings and other structural improvements under the P-3 Mid-Life Upgrade, or MLU, program, as well as receiving new avionics and mission equipment suites. Since the 1980s, older fighter types stored at The Boneyard, such as F-100s, F-106s, and F-4s, have returned to flight—although without pilots in the cockpit—as full-scale aerial targets. Now, early model F-16s are being converted into target drones to give pilots who are training in F-22s and F-35s a highly maneuverable, more technologically worthy air combat adversary. AMARG is popular with the general public as well. Five days a week, the next-door Pima Air & Space Museum buses visitors through the complex. Close to 30,000 people a year tour the Boneyard to see several thousand C-130s, P-3s, F-16s, S-3s, C-5s, E-2s, F/A-18s, KC-135s, B-52s, and several other aircraft types parked in one place. Visitors are also driven down Display Row where some historic examples of most major types of aircraft stored at the site is on exhibit along with some one-offs, like a US Navy T2V SeaStar trainer that dates back to 1956, which is one of the oldest aircraft at AMARG. Nearby, an LC-130R, nicknamed The Phoenix, was the Ski-Herk that crashed in Antarctica in 1971, was repaired on the ice nearly seventeen years later, and then returned to service. “AMARG is also a popular spot for TV shows,” said Pittman. “Larry the Cable Guy filmed a special here, the Jeopardy! Clue Crew has been here; the History and Travel Channels, BBC, and the Smithsonian channel have all filmed specials there.” A couple of C-5As and C-130s were used as part of an obstacle course for the TBS show The Great Escape in 2012. A critical component of the F-35B short takeoff/vertical landing, STOVL, variant of the Lightning II is the three-bearing swivel duct nozzle, or 3BSD. Getting the AEHF-3 satellite from a clean room in California to orbit via truck, C-5M Super Galaxy, and Atlas V.
The worldwide community of C-130J Super Hercules operators surpassed the one million flight hour milestone in April 2013. Clarence “Kelly” Johnson founded the Skunk Works after he and his team created and delivered the XP-80 to the US Army Air Forces in only 143 days. Centennial Falcon commemorates the anniversary of aviation in Thailand. Total Force Integration leverages Air Reserve experience, improves access to aircraft, encourages retention, and increases total force effectiveness. © 2014 Lockheed Martin Aeronautics Company. All Rights Reserved.